It was grey and drizzly outside. Morris stood in the lobby, just another listless face in the small knot of early-risers waiting for the elevator. He’d spilled his coffee on the bus; he was going to have to bleach the hell out of that shirt as soon as he got home that evening. No one spoke, not once, all the way up to the 89th floor. Gerard from Tech Support(#17) gave a short, gruff cough as he shouldered his way out onto his floor, about halfway up, but no one could even manage a “Bless you.” They just shuffled around a bit, edging another couple inches away from each other to fill up the space he’d left behind. It was that kind of morning. With a small ‘ding,’ the doors finally slid open onto the all-too-familiar sign: “89. MONSTERCORP: ACCOUNTING.” Morris stepped out, slowly maneuvering his bulk onto the same mangy, pea-green carpet he’d lumbered up and down every day for… well, for far, far too long. He wondered, for the umpteenth time, what had possessed them to carpet the place in pea-green. He turned the corner into his cramped cubicle, eyes down, his head full of carpeting alternatives and bleaching methods. Was today Wednesday or Thursday? When was that performance review again? Muttering slightly, he took off his raincoat and hung it on the back of his chair. He sat, heaving himself into the seat, ignoring the little creak of protest; he swiveled around to face the desk, reaching out to switch on his computer. He stopped, arm still outstretched. Frozen. There, lying across his keyboard, was the most gorgeous flower he’d ever seen. A sudden, icy wave of panic washed over him. He looked around guiltily, convinced for one startled moment that he was in the wrong cubicle — but no, no, this was the right place. Those were his post-its on the monitor, his pencils in the cup. That was his keyboard. Which… meant that it was, presumably, his flower. Morris sat, staring at the flower, reading and re-reading the note, his mouth a small ‘o’ of disbelief. He remembered valentines, the lacy-edged construction paper hearts you made in class, before recess, under the supervision of your teacher. He remembered short poems about violets and roses and smells. He remembered he’d never really gotten very many. The more he looked at it, the more he had to accept that yes, it really was real. He had no idea what kind of flower it was; he’d never had much interest in such things… And it gently dawned on him that he’d never wanted anything more than how much he wanted, right this instant, to know the name of this flower. The blossom still clutched tightly in his hand, Morris silently got up out of his chair, poking his head up over the top edge of his cubicle dividers. He felt himself smiling — just a little one at first, but soon a toothy grin that spread out across his whole face. His tendrils began waving, slowly, gleefully. For the first time since he’d started wearing it, his mood tie turned from its usual dull brown to white — bright white, speckled with pink polka dots. Grinning like a maniac, feeling Alive (yes, with a capital A), and with all four of his hearts thudding in their cages, Morris looked out across the sea of cubicles. Esteban was a wreck. His flight to Warsaw was delayed due to heavy snow in Prague. His gate was almost empty, everyone had taken other flights, but he was bound for MonsterAir, because that was the only airline that his company worked with, they had obviously closed a deal which provided the employees with really cheap tickets. So here he was. He’d just finished a sandwich. That kind you always get in the plane, like a triangle with ham or cheese. He’d choosen ham because he’d been working out since he was eleven, and was very careful to eat proteins. Esteban was bored to death, and there wasn’t really anyone to speak with. Some nuns that obviously only afforded MonsterAir, and were waiting like him. Behind them was a great big red hair, but the woman never turned back so he didn’t know how she looked. He could smell her scent of roses, some kind of exclusive perfume. But if she was a business kind of woman she should afford another flight, but the MonsterAir. Two hours later he was bored to death. His cell beeped, and a reminder displayed an input he’d made a couple of months ago, to buy Kiera a rose on valentine’s day. Now that they had broke up it didn’t make any sense. But he had bought a rose to a girl or woman every year, from the day his dad explained this very day to him and gave him a coouple of bucks to get his mom or sister a rose, just to keep the tradition alive. This would be the first year not to buy a rose, and where on this airport, and who would he give it to? The gatestaff announced that there wouldn’t be another flight leaving the airport for the next five or six hours, and that MonsterAir had catered their passengers food in the Italian Bistro. As he finished his carbonara, Esteban noticed that the bistro had a couple of flowers next to the lavatory. He left for the lavatory to wash his hands after the meal and brought the Daily Mail he’d flickered through whilst eating. He snapped a red flower from its pot, and put it carefully inside the rolled-up magazine. It fitted inside the roll, and noone noticed his little thievery. As he walked back to the gate the red hair- woman faced him for a second when she went inside the Wok Bistro, to get something for her MonsterAir Food Coupons that they were given before. Esteban followed her and spent his last coupon on a lemonsoda in the bar. The only vacant seat in the restaurant was at the table next to hers. As he sat down she glanced over and smiled at him. They talked for some time, about the weather and airport. Then he interrupted and told her about what day it was, and his familys tradition. He couldnt get a hold of a rose, but a lovely red flower. Her own perfume filled tha air with the scnt of roses, so the rosey feeling wasn’t lost after all. He told her that he had to give it away, because he thought it would be sad if the tradition was to be broken, and that it didn’t mean anythin g else. But it would be nice to have a coffee with her though, if she would like to have one? And here I sit on Valentine’s day, with a stupid boyfriend who probably didn’t get me Anything. I’m dumping him, and I am hereby humbly asking Monster 89 (I don’t even know his name) if, by any chance, that flower might be for me? when ramone saw the delicate pink flower growing out of a crack in the sidewalk on 39th that morning, he knew today would be the day. he would not be deterred by unrequited love. gilda in accounting might give all the romantic vibes of an old can of sardines, but ramone longed for her and knew that, given the chance, he could get gilda to let her tenticles down. today, when the working day was done, ramone would wait in the lobby holding that pink flower and when gilda stepped off the elevator, he would offer the flower and an invitation to grab some hot chocolate with him at the diner across the street. 40 years and 5 kids later, ramone still brings gilda a pink flower and hot chocolate on valentines day. He is a master of white-collar crime. His mistress ratted him out. He knows it was her; his wife, after all, didn’t know. The flower will give his mistress a horrible allergic reaction, he’s sure of it. Harlow Higgins is the bulletproof owner of the Florist Money Laundering Company. He brings a flower to his girl and wants her to take it. Its the blood rose of marriage, his beings sign that its time to wed. He wares the tie to not only complement the flower, but also to say that spots get him on. I wonder of she will say yes? She has to after a flower like that. I get the goosepimples when he waves his crown-hairs like that. And he brought me my favorite: taffy-flower! Ever the gent, he’s already softened it up for me. What a guy. I’d be his valentine any day of the year. Especially if his taste in ties persists. And even more especially if he makes those ties from the tongue of the spotted Elderberry Blarfoog (the Blarfoogs of this species are regenerative folk, no worries – in fact, they need regular tongue-pulling to keep the gene pool varied). Happy V Day everyone, and what a literary crowd this is! huzzah! The air bubbles made their way to the surface of the water with their characteristic burping noises. The water cooler gladly dispensed another cup to a diligent, yet thirsty, employee. They gathered about the cooler as so often was the case at two in the afternoon. Like clockwork, when five after two ticked by, Dario approached the cooler for his turn at the spout. A portly fellow, Dario was never seen without an outrageous tie to compliment his never present smile. Getting so much as a wry grin from Dario was as easy as adding two even numbers to equal an odd. Once inside the quiet safety of his office, however, Dario opened a small drawer beside his desk and peered inside. Tucked securely within, was a small, vibrantly pink flower. That morning, before heading to work, a young lady living two doors down from Dario’s apartment had shyly given him the flower as a Valentine’s present. She told him how she had noticed him every day as he entered and left the building. He didn’t hesitate to accept the kind gift and thanked the beautiful woman for her thoughtfulness. He held it up to the window and as the rays of sun struck its petals and leaves, it breathed with life, expanding and contracting with a hypnotic rhythm. Thinking about his neighbor and watching the flower pulse excited Dario. And on that day, in the secluded confines of his private office, he smiled. He smiled big. After all, what harm was a slip of a smile if nobody would ever see it. I don’t have a story, but I have been really appreciating the monsters almost right from the start, and sad to see they’ll be ending! 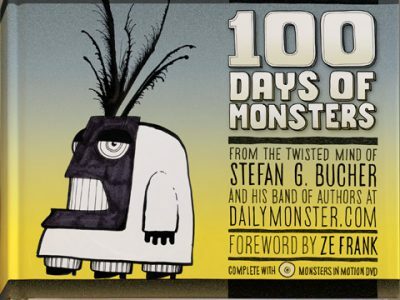 Please, Mr Stefan G. Bucher, don’t make the nearly finished monster the poster frame for the movies! It ruins the surprise of seeing them made, which is my favorite part! Hello Charles. I agree with you entirely on the poster frame issue. This comes from Revver, where they seem to have changed the default. I’ve forwarded your comment to them, because you’re right: It ruins the surprise! I hope they’ll fix it soon. Until then, I’m a bit at their mercy. Keep your fingers crossed! Alair Unbeholfen is seen presenting the Pink Spritzenblume to his crush, Condie Rice in this undated photograph. Liebenswürdig ist der Gute, auch sicher in gediegenen Umgangsformen, doch eines fehlt ihm, Cyrano’s dichterisches Talent und dessen Freundes Aussehen. Seine Mutter hat ihm deshalb geraten eine schrille Kravatte zu tragen. Das lenkt den Blick der Angebeteten vom Rest weg. Ihre Freundin eine nette Floristin, hat ihn darauf hingewiesen, den Satz “Sag’s mit Blumen” ganz wörtlich zu nehmen, dann könne gar nichts schief gehen. Was sie allerdings vergessen hat, den geistig Minderbemittelten darauf hinzuweisen, dass “Sag’s mit Blumen” bei übelriechenden Sorten,(hier die i-gitt Blume), nicht ohne, zumindest entschuldigende Worte auskommt. Vielleicht wäre es doch besser gewesen ihn in die hohe Kunst des jambischen Versmasses einzuführen als ihn dieser Blamage auszusetzen.